Investigate Earth from space, with satellite images, news, facts and fun activities. Cool facts about the Earth, Sun, Solar System and other space objects. Explore the structure of the Earth with clickable diagrams and picture puzzles. Lots about the Earth, the environment, plants, animals and conservation. Watch a video clip about rainforests and find out why they're important. Keep up with the latest news on climate change. Includes pages revealing the problems of climate change and ways to reduce global warming. With over 80 sturdy flaps, and internet links to websites to find out more. Loads of easily accessible information is packed into this attractive interactive information book. Busy spreads draw readers in to explore different aspects of the Earth from where it is in the solar system to the geography you can find on it. And it’s easy to discover more by opening flaps. Lift the flaps on each brightly coloured page of this book to uncover lots of amazing information about how the Earth works. With over 80 flip-up panels, and packed with cheerful, cartoonish illustrations, this is an enjoyable, geographical starting point for age six upward. How can any youngster lift a flap in this book and not want to save the world! Winner of a silver award from the Geographical Association, when it was published in 2009, it's jokey and enticing, and 20p from every copy sold goes to Friends of the Earth. This book would be an immediate hit in your class library, as it follows the popular interactive ‘flap’ format, loved by all children. With over 80 flaps, this lively guide to our planet is packed full of interesting snippets of information, ideal for dipping into. 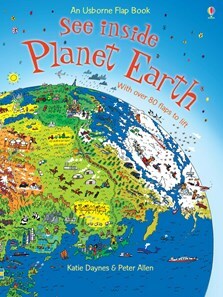 This book will tell your children all the things they need to know about the climate and nature and the world around them and give them an idea of how different other countries are. A great way to inspire early interest in science and geography. This entertaining book is bound to captivate children as it explains the mysteries of Earth's geography and reveals hidden secrets of life on our planet with bright illustrations, fun facts and pull up flaps. A thought provoking book for kids. "perfect for readers aged 6+"
The wealth of detail in the colourful, cheerful, cartoon-style illustrations makes repeated readings rewarding. There is a strong environmental theme throughout the book, and the final double-page spread is devoted to the small changes everyone can make to combat climate change.